An upcoming exhibition at the Royal Academy in London brings together the work of Bill Viola and Michelangelo - artists who, though filtered through vastly different eras, cultures and media, explore themes of mortality and transcendence. 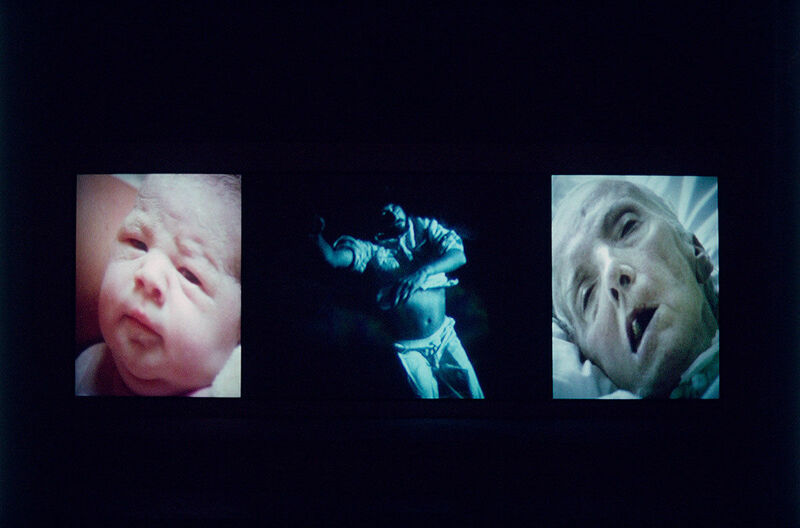 In Bill Viola / Michelangelo: Life Death Rebirth works by both artists are arranged to create an immersive ‘cycle of life’ which the visitor passes through. Renaissance master Michelangelo Buonarotti is perhaps best known for his grand sculptures and expansive frescoes. His work is closely connected to religion and the sacred, frequently referencing divine beings and beings at the threshold of life and death. Transcendence and mortality - including his own mortality - are key themes in his work. Michelangelo is also renowned for his elegant and powerful studies of the human form through sculpture, painting and intricate drawings. Life Death Rebirth presents a selection of works by Michelangelo including the Virgin and Child with the infant St John or the Taddei Tondo, which is the only marble sculpture by the artist in the UK, and his Crucifixion drawings. Bill Viola’s work, like Michelangelo’s, reflects on life and death, religion and power, and their influence on the human body. There is a direct link between the artists in that Viola’s work is inspired by that of Michelangelo - Viola was particularly impressed by the 2006 exhibition of Michelangelo’s drawings at Windsor Castle. Twelve major video installations by Viola are on display in the exhibition. These include the five-metre-high projection, Tristan’s Ascension (The Sound of a Mountain Under a Waterfall) (2005) and the 1992 work Nantes Triptych. The video works span the entirety of Viola’s career - one whose poetic reflections on birth, life and death has transformed the video art genre and inspired new generations of artists. Running from 26 January to 31 March 2019, Life Death Rebirth is a unique opportunity to discover the relationship between the works of two artists who use stone, chalk and pixels to think about flesh, blood, and what lies beyond the body. Bill Viola / Michelangelo: Life Death Rebirth is on show at the Main Galleries, Royal Academy, Burlington House, Piccadilly, London, UK from 26 January to 31 March. The exhibition is supported by Blain Southern, the Royal Collection Trust, the Genesis Foundation and the Dunard Fund.